To learn more about the NSE program, please sign up for one of the sessions taking place in the International and Exchange Student Center this fall. 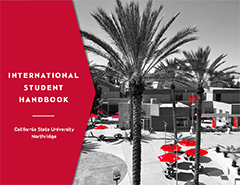 After viewing/attending the information session, email study.abroad@csun.edu to make an appointment with Eleanor Wolgast to obtain an application form and discuss your options. To get started on your NSE application, APPLY HERE. You can choose up to five colleges on your application form. You will only be placed at one school, so it is important that you list your schools in order of preference. Past participants in the program have all been placed at one of their five choices. To find out which colleges offer your major, visit the National Student Exchange website. Select your major from the drop down menu and all the colleges that offer your major will be listed. You can then select up to five colleges to put on your application form. The priority closing date is February 1, 2019. It is strongly advised that you submit your application by the priority deadline. The FINAL closing date is March 3, 2019. There is a non-refundable application fee which is currently $250*. This fee must be paid at the time you submit your application by check or money order made payable to CSUN NSE. The NSE Central Office charges CSUN for all student placements, which is why the fee is charged to NSE applicants.